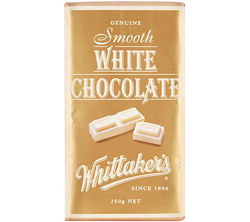 Whittakers smooth and creamy white chocolate. Sugar, Milk Powder, Cocoa butter, Emulsifier (Soya Lecithin), Vanilla Flavour. White Chocolate contains Milk Solids 30%, Cocoa Solids 28%.